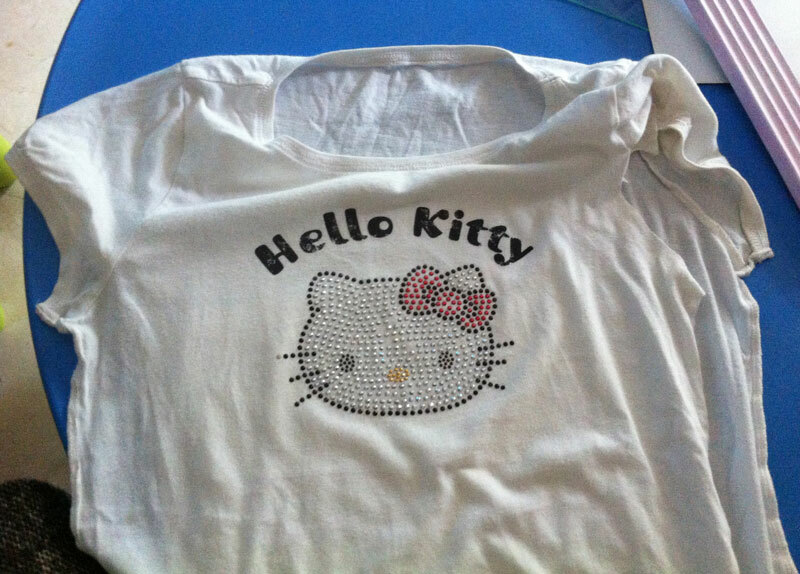 If you have daughters or girls in the family I’m sure you know Hello Kitty. There was a time my girls loved it, they even had clothes of her and they wore them happily. But girls grow and clothes don’t, so tragedy is served. What can you do if you have one small T-shirt that doesn’t fit your daughter anymore? Something this simple. 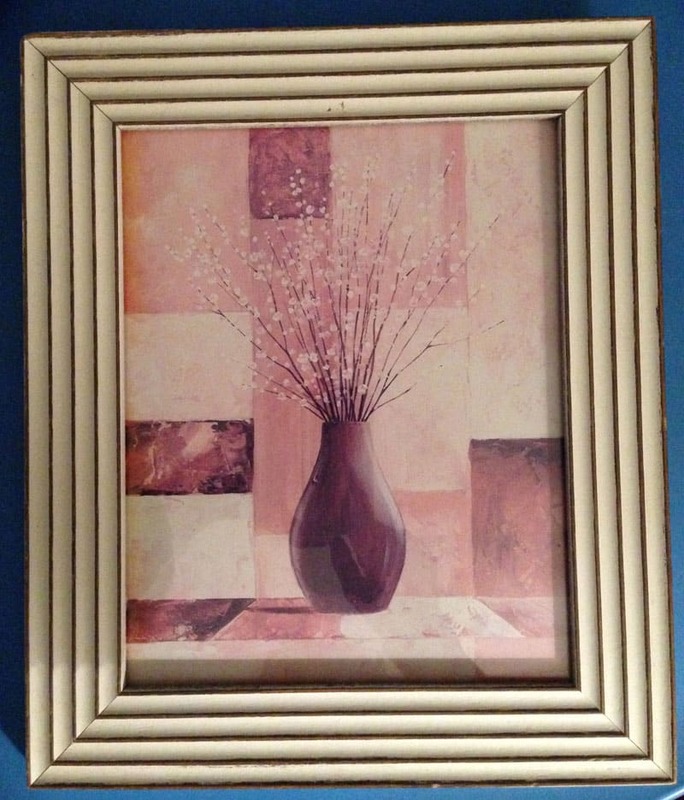 I took an old ugly frame I found at a flea market, and decided to paint it pink with some shadows of white. I used my homemade chalk paint for this. I added a bit of red to the white chalk paint and mixed it. 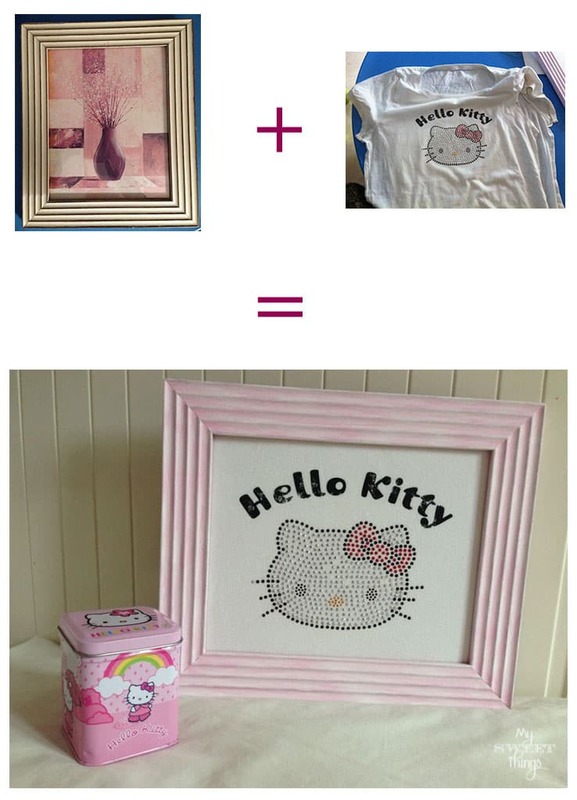 Then I dry brushed the frame with some white, then stapled the T-shirt on it and I was done, we had a pretty Hello Kitty picture! Is there anything simpler than this? Now you know, don’t throw away those all T-shirts with a drawing you like. This entry was posted in Before & After and tagged Before & After, Chalk Paint, Creativity, Fabric, Kids, Recycle. Yay!! My kind of re purpose !! I love anything having to do with old clothing! ! So cute! Yes, mine too! Easy and cute!! Very cute Pili! I remember the Hello Kitty aera! And luckily there were no stains anywhere on the shirt. My kids always have stains everywhere. Great idea! First of all: it’s Hello Kitty so it’s awesome!!!! 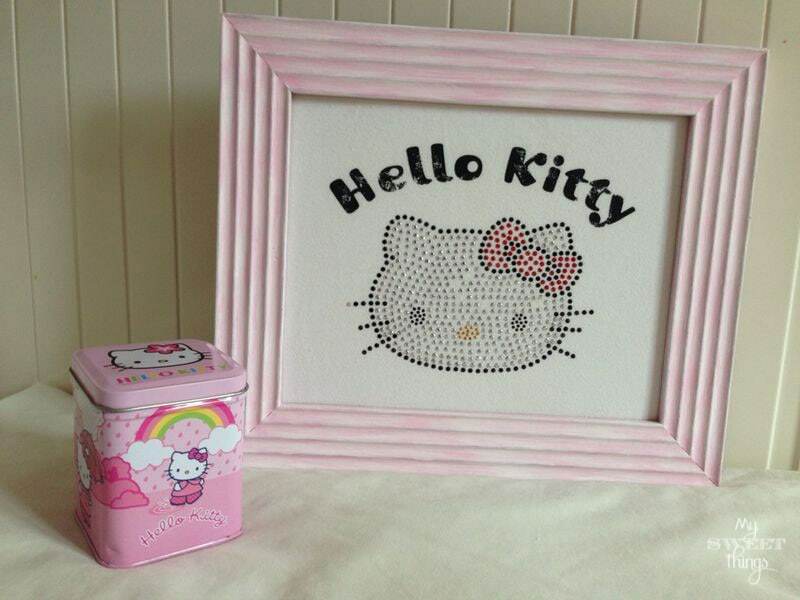 Yes, Hello Kitty is a whole world itself! I love how you constantly come up with these ‘why-didn’t-I-think-of-that’ posts that are so simple, and so amazing at the same time. Thanks for sharing with the #GoodFriendsFriday linky party, our latest post is live! What a cute idea! Thanks for sharing at Snickerdoodle Sunday! What a simple but effective idea. I don’t have much in the way of motif shirts but if I do ever need to throw on old favourite away, I’ll know what to do with it. You’re so clever! I don’t either, but you know what happens with little girls… I will do what is necessary to avoid a battle! Pili, this is a great idea, the kids had certain pieces of clothing they loved and didn’t want to get rid of, this is a great way to still show it off and love it! And the frame fits it’s perfectly!!! What a sweet idea for recycle! Very clever! Thank you for sharing this inspiration at Making Broken Beautiful! I hope you will come and inspire again! Thanks a lot for your kind comments, Terry! I LOVE this!! I used one of my daughter’s shirts that she got for her birthday and made a little pillow out of it. But I love the framed art idea even better! Thank you so much for sharing at my craft party on Thursday! Hope to see your newest posts this week, which starts at 7pm EST.